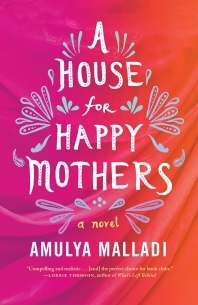 Product description: A HOUSE FOR HAPPY MOTHERS is written by Malladi amulya and published by Lake union. Buy A HOUSE FOR HAPPY MOTHERS by Malladi amulya from markmybook.com. An online bokstore for all kind of fiction, non fiction books and novels of English, Hindi & other Indian Languages. In trendy Silicon Valley, Priya has everything she needs--a loving husband, a career, and a home--but the one thing she wants most is the child she`s unable to have. In a Southern Indian village, Asha doesn`t have much--raising two children in a tiny hut, she and her husband can barely keep a tin roof over their heads--but she wants a better education for her gifted son. Pressured by her family, Asha reluctantly checks into the Happy Mothers House` a baby farm where she can rent her only asset--her womb--to a childless couple overseas. To the dismay of friends and family, Priya places her faith in a woman she`s never met to make her dreams of motherhood come true. Together, the two women discover the best and the worst that India`s rising surrogacy industry has to offer, bridging continents and cultures to bring a new life into the world--and renewed hope to each other.